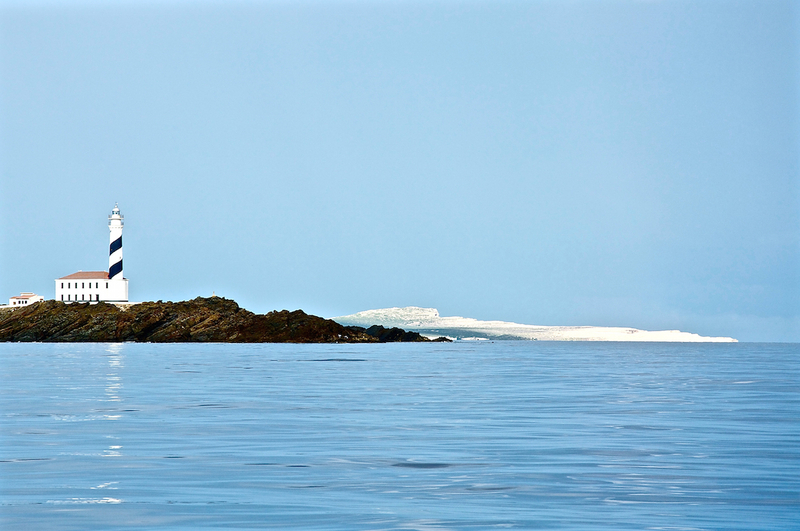 We still needed 600 certified nautical miles of the 1,000 required for our permits. So we signed up for a week of “instructive cruising” wit the Swiss Cruising Club in the Balearic islands. 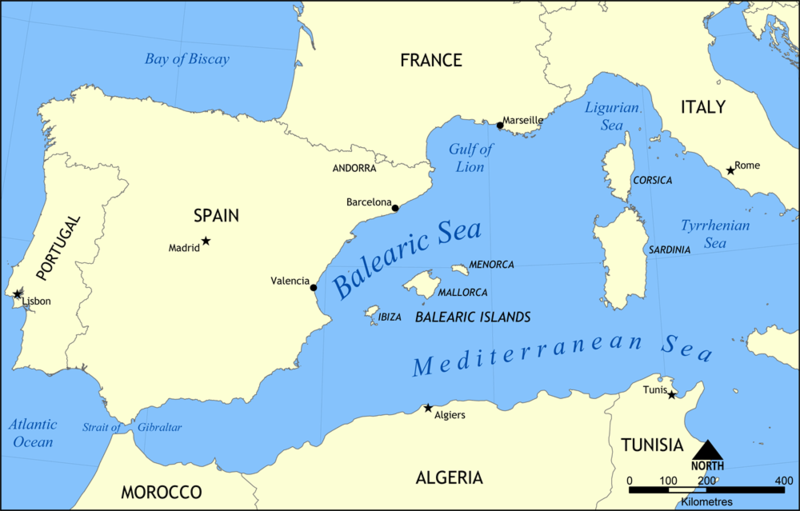 A map of the Balearic Islands of Spain. Map created by Norman Einstein, May 26, 2006. Palma de Mallorca was a pleasant surprise. Even during the last week of October, the temperatures were quite warm, ranging between 28° during the day and 16° at night. We would have loved to have had more time to explore the city as it is steeped in history, having been conquered by such cultures as the Minoans, the Carthaginians, the Romans, the Byzantines and the British. The Cruising Club charted three Sun Odyssey 43s, all based in the Real Club Nautico di Palma. 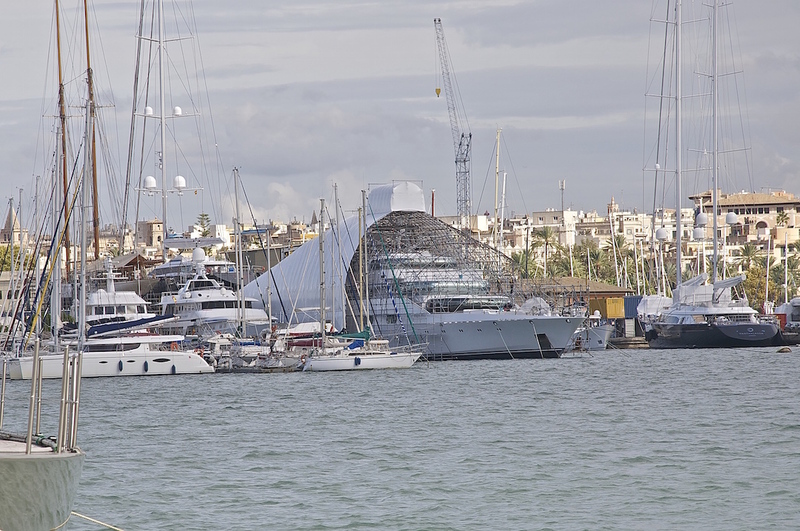 The marina was close to a super yacht maintenance and refit facility and I have to say we’d never seen, in real life, so many super yachts (we’re talking 300 feet and up!) all in one place. 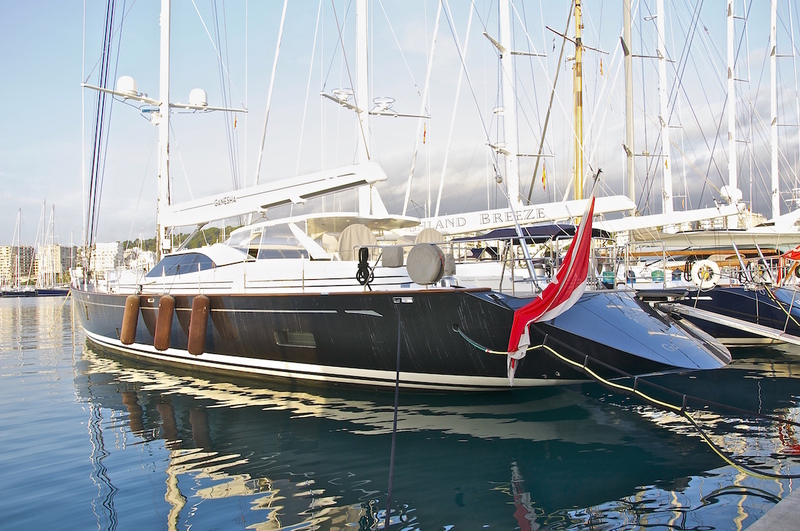 Palma de Mallorca is quite a convenient place to charter as the marina is only about 20 minutes from the airport and there’s an XXL Carrefour supermarket on the way. Our strategy, since we were a total of 7 crew in the boat, was to rent a minivan at the airport and use it for transportation and provisioning at the Supermarket. Jacques and I returned the van to the airport a few hours later and returned to the marina by taxi. We then had a lovely dinner of local wine and tapas at a Tapas bar close to the marina before turning in early to get a good start the next day. Breakfast in the cockpit at Real Club Nautico di Palma. The following morning was a blustery one, with gusts up to 30 knots. Our departure out of the harbour was cut short by the mainsail outhaul block exploding under the force of the wind as we unfurled the sail. We radioed the charter company and went right back to our berth. The manager at Sun Charter explained that the boat was up for a some major refitting during the winter and was scheduled to have the sails and running rigging changed. We just had the rotten luck of using some dying equipment at the end of the season. It took a few hours to change the block and re-rig the mainsail, and we finally sailed out of the harbour at around 3 o’clock. 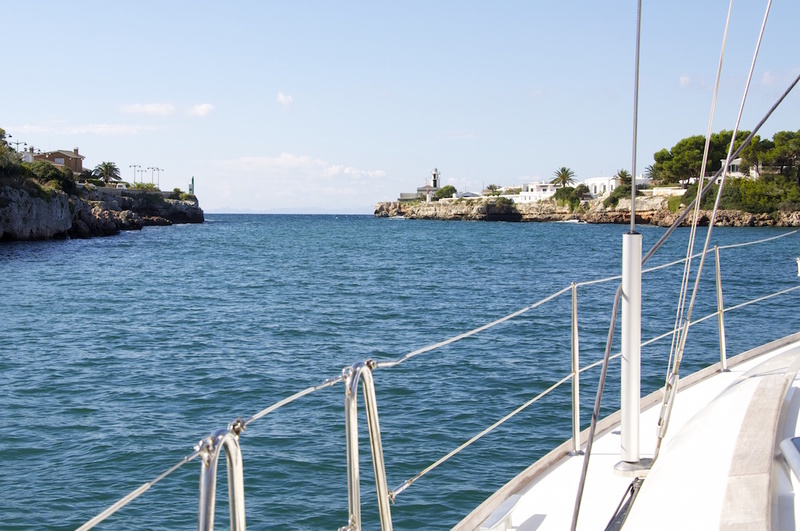 We set off in the direction of Minorca, which is smaller and less developed that of Mallorca. We managed to slip into a tiny marina on the south coast of Mallorca at around midnight. 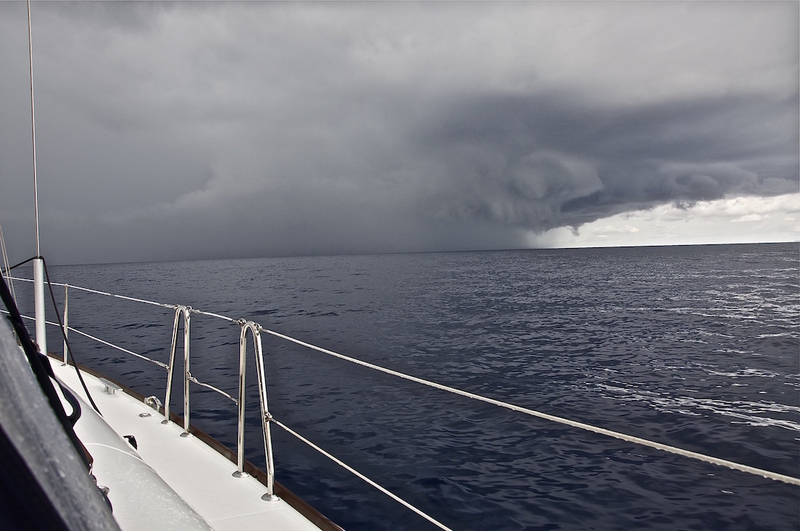 The wind and the chop had made most of us quite seasick so we decided to not continue all night to Minorca. The rest of the week was lovely with rather good wind and lots of sun. 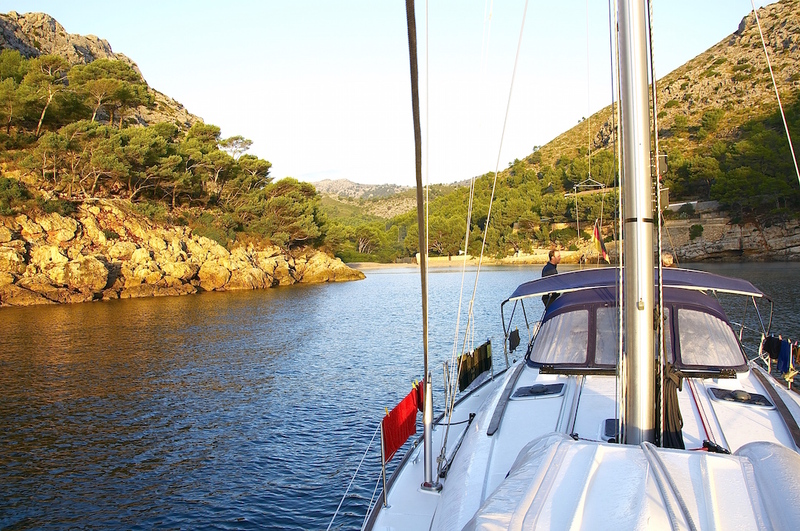 We stayed in the lovely ports of Ciutadella, Mahon and Fornells as well as a beautiful anchorage on the east coast near Mahon. 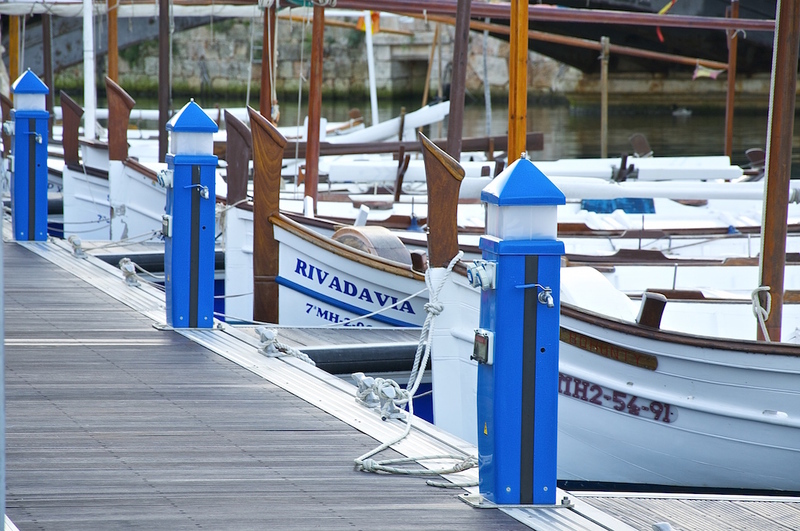 The port of Ciutadella on the island of Minorca. These are the traditional fishing boats of the area. The entrance/exit channel of the port of Ciutadella on Minorca. 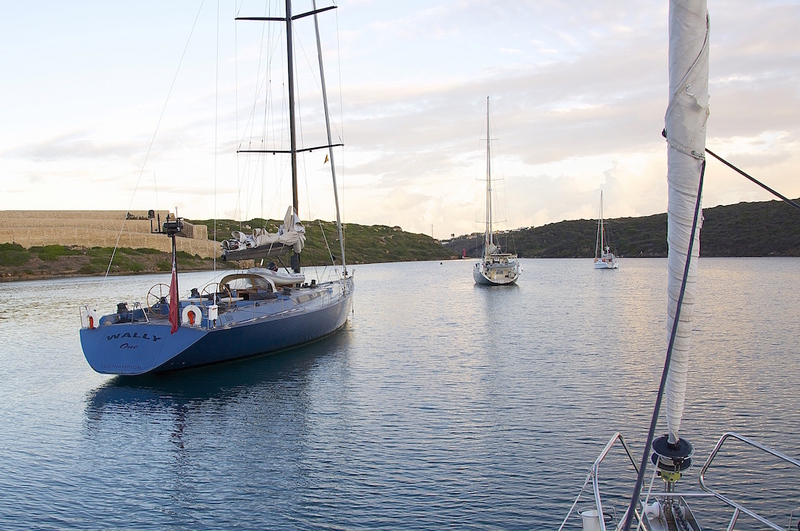 A well-protected anchorage just outside of the port of Mahon on Minorca. 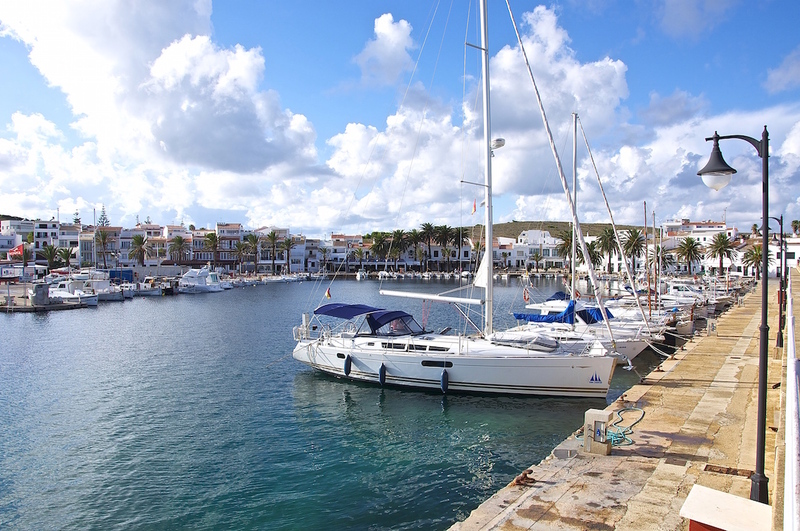 The delightful marina in Fornells on the island of Minorca. 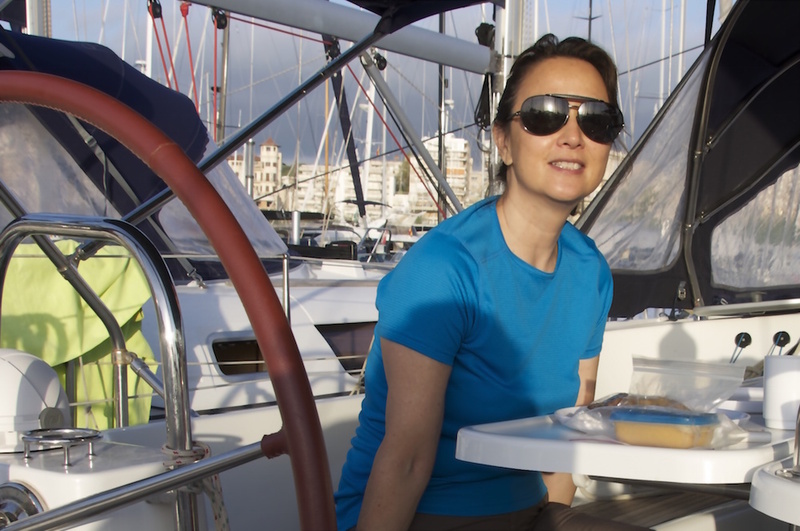 The cruise back to Mallorca was marred by a series of squalls, but by the time we reached our anchorage in a calla (little cove) near Cap Formentor the weather had turned sunny and calm. 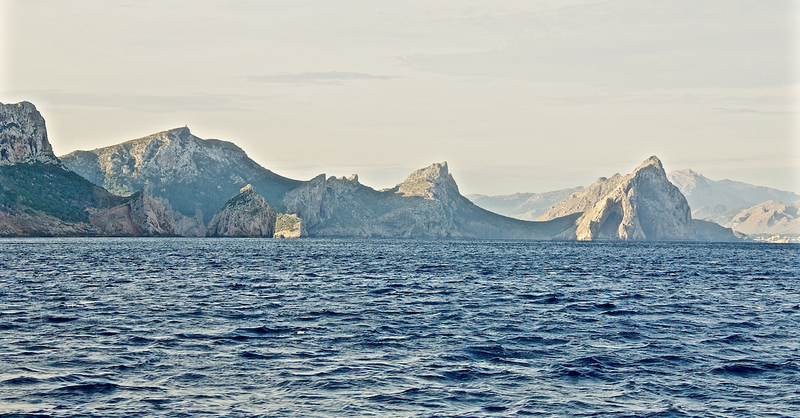 We then cruised along the majestic north coast of Mallorca, with its steep mountains and rocky coastline. 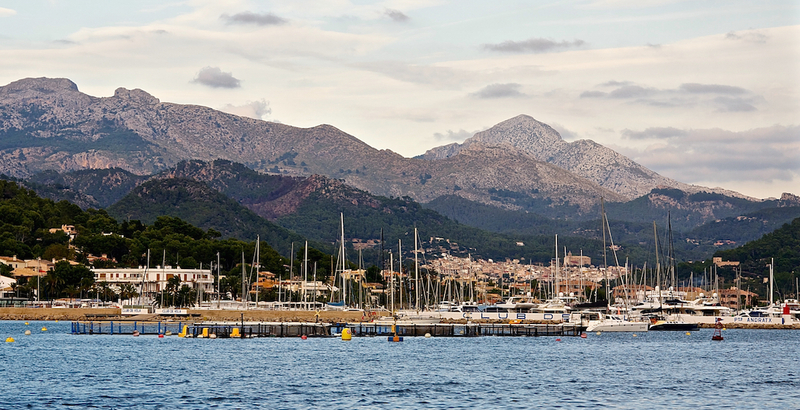 The pleasant Port de Andratx was our last stop before returning to Palma. This is a town that seems to cater to a calmer, more mature brand of tourist, rather than the young, drunk, rowdy 18-year-old types you’ll find in Magaluf, a bit further away. It was filled with charming restaurants and bars filled with couples spending a romantic friday night. 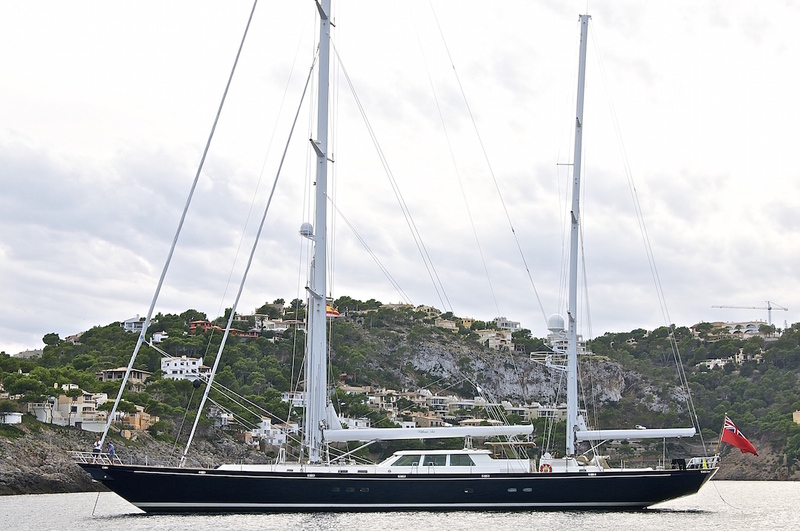 The cost of the berth at the Club de Vela was expensive at 80 Euros (for a 43-foot boat), but the facilities are first class, with luxurious showers and a swimming pool.